Editor’s note: The following guest post is written by Phil Libin, CEO of Evernote, which is currently the No. 5 app in the Mac App Store. It also didn’t hurt that the app has been prominently featured by Apple. I remember one of the first computer articles that I ever read (maybe it was in Byte Magazine in the early 80s while I was in junior high). It had a little survey aimed at my fellow nerds. “Do you buy software for your computer?”, was the first question. The choices were, “A) Yes, frequently. B) Yes, sometimes. and C) Rarely, I prefer to write my own.” The fact that C was a viable choice pretty much sums up the early euphoria of the consumer software industry. You just had to make something great and the rest would follow. That was a long time ago. The following twenty or thirty years brought us monopolies and barriers to entry and this happy state of affairs became a dim memory. Then came the mobile app explosion. Over the past year, about 70% of Evernote’s new users came from mobile app stores, mostly iOS and Android. This led us to the understandable conclusion that mobile was the crucial thing that made a platform attractive to independent developers. Last week made us realize that the reality is a little bit more nuanced. It isn’t mobile that’s overwhelmingly important, it’s the app store. Until a week ago, all the good app stores just happened to be on mobile devices, but someone with a shiny new Macbook is just as eager to get the best apps as someone with a shiny new iPhone. A platform without a well-formed app store presents a huge challenge to developers. To succeed on such a platform, the developer has to spend as much time and money on channels, logistics, partnerships and advertising as on actually making a great product. Once an app store takes hold, the software market on a platform starts moving towards a meritocracy. This is imperfect, of course, but focusing on building a great product is the best strategy for succeeding on an app store. This is a huge boon for software nerds of all types, and has resulted in the explosion of mobile apps and services in the past two years. It’s about time that desktops joined the party. It took a few weeks of non-trivial effort to get our existing Mac application ready for the app store. There’s never a convenient time to take a few weeks out of a busy development schedule, and December is as inconvenient as it gets, but Apple’s developer relations folks were helpful and the approval process itself worked reasonably well once we’d worked out the kinks. The results speak for themselves. About 320,000 people downloaded Evernote in the first week of the Mac App Store. Of this number, about 120,000 had never used Evernote before, and created new accounts. This represents more than 50% of all the new Evernote accounts created last week. The Mac platform—which used to be in fourth place for new user registrations behind iOS, Android and Windows—has now jumped to first. I hope Windows gets a good app store soon. Not only is the Mac App Store getting us new users, it’s making our existing users more valuable. Neat, but how? So 320,000 people downloaded Evernote in the first week and 120,000 of them became new users. What happened to the rest? Well, about 80,000 people were either switching their Mac client from our direct-download version to the app store version or had simply downloaded the app and didn’t complete registration. 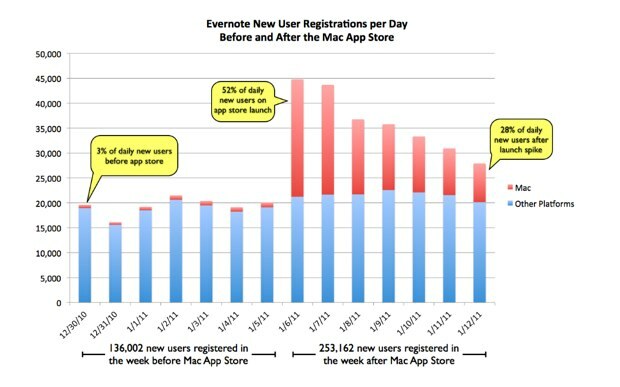 Another 100,000 people were existing users who had previously used Evernote from other platforms (mostly the iPhone) and added the Mac version for the first time. This is both interesting and important. Interesting because the vast majority of these people must have (1) already had Macs, and (2) known about our Mac version from previous interactions with Evernote but hadn’t bothered to install it until the Mac App Store appeared. Important because people who use Evernote from multiple devices are much more likely to stick around and to eventually pay for the premium version. This makes intuitive sense and the data is clear: in a Freemium model, people choose to pay for what they love and the more devices they use Evernote from, the more likely they are to fall in love with it. The Mac App Store effect works the other way as well: many of the new users who first found us on the Mac App Store went on to also download Evernote on their mobile devices. Our iTunes downloads for iOS devices were up by 54% during the same week that the Mac App Store came out and that’s without any new versions or noticeable change in iOS app visibility. If Evernote’s desktop clients were written in Adobe AIR, I’d be worried right now. The immediate popularity of the Mac App Store, and the iPhone App Store before it, reinforces my belief that in a world of infinite software choice, people gravitate towards the products with the best overall user experience. It’s very hard for something developed in a cross-platform, lowest-common-denominator technology to provide as nice an experience as a similar native app. As the CEO of a software company, I wish this weren’t true. I’d love to build one version of our App that could work everywhere. Instead, we develop separate native versions for Windows, Mac, Desktop Web, iOS, Android, BlackBerry, HP WebOS and (coming soon) Windows Phone 7. We do it because the results are better and, frankly, that’s all-important. We could probably save 70% of our development budget by switching to a single, cross-platform client, but we would probably lose 80% of our users. And we’d be shut out of most app stores and go back to worrying about distribution. Does this mean that web apps are doomed? Not at all, but the most successful web apps will be the ones that emphasize unique benefits—sharing, communications, integrations—that are better implemented on the web than in native code. This is the main design goal for the next version of the Evernote web client, by the way. Lost among all the gloomy economic news of the past few years is the fact that there’s never been a better time to be in software. Sure, the emergence and inevitable dominance of app stores will permanently disrupt existing industry practices—I’m glad we’re not in the business of preventing people from making copies of bits, shipping shrink-wrapped boxes or charging people for periodic upgrades—but a company like Evernote simply could not have attained a fraction of our current momentum even three years ago. App stores, cloud services, cross-platform users and Freemium economics made it all possible. The download numbers are certain to decline a bit as the excitement of the first week finds a sustainable steady-state, but the launch of the Mac App Store will have a major, and permanent, positive impact on developers.